The Lombok Strait marks the passage of the biogeographical division between the fauna of the Indomalayan ecozone and the distinctly different fauna of Australasia that is known as the Wallace Line, for Alfred Russel Wallace, who first remarked upon the distinction between these two major biomes. 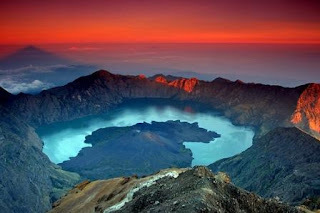 The island's topography is dominated by the centrally-located stratovolcano Mount Rinjani, which rises to 3,726 m (12,224 ft), making it the third-highest in Indonesia. The most recent eruption of Rinjani was in May-June, 2009, which was a small oozing eruption of 'Gunung Baru' (New Mountain). The volcano, and its crater lake, 'Segara Anak' (child of the sea), are protected by a National Park established in 1997. The southern part of the island is a fertile plain where corn, rice, coffee, tobacco, and cotton are grown.